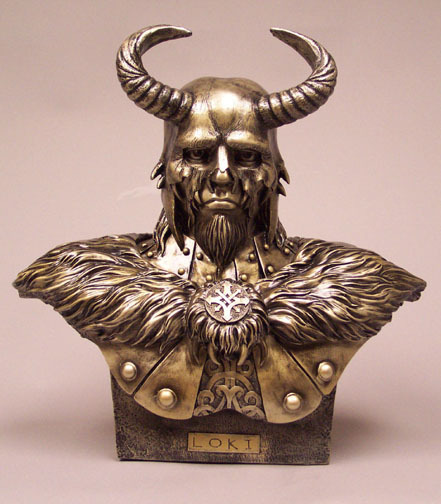 If ever you have the desire to spark controversy and heated debate in the heathen community, ask whether or not Loki should be honored in rituals and workings. I can assure you the results that follow are always interesting. Some Theodish traditionalists refuse to even utter Loki’s name, and it is against their norm to ever allow his name to be mentioned in their halls. Others argue the dual-nature of Loki, and that he brings gifts as well as troubles. Nonetheless, Loki is one of my personal favorites . I tend to think Snorri’s translation of the Prose Edda paints Loki to be very evil, while I see him as neither good nor bad. I think his actions are more mischievous, like that of a school-child playing around, than they are wicked and filled with ill intent. However, I will present both sides of him and leave it up for you to decide. Loki: Good, evil or somewhere in-between? While Loki did not have many stories singularly dedicated to him, he was an important role in many other stories centered around the other Gods. He tends to bring a touch of comedy to the tales of the Gods. Loki is also a very social character: he travels often and communicates with many of the important Gods, often he is in the company of Thor or Odin. He plays a specific part in the creation and destruction of the world itself. Regardless of Loki’s morality, he is a very important deity. Loki first married Glut (“Glow”) who bore him two daughters named Eisa (“Ember”) and Einmyria (“Ashes”). This is more evidence leading us to believe he was originally a fire god. His second marriage was to a giantess, Angur-boda. These two had three children who were considered to be monsters by the rest of the Gods. First was his daughter, Hel, who became a Goddess of Death. Second was the Midgard snake, Iormungandr. Third was the gigantic wolf, Fenris. Not long after they were born, the other Gods feared for their own safety and took them away. His third and successful marriage was to Sigyn. She bore two sons: Narve and Vali. Sigyn proved to be very devoted to Loki and remained faithful to him, even when he was thrown from Asgard (as you will see below). Once the Gods of Asgard became worried that they were not entirely secure from an attack from Frost Giants. When they began to worry, a stranger appeared and claimed himself to be an architect. He offered to build them an impregnable fortress if they would give to him the sun, moon and Freyja. The Gods were hesitant at first, but Loki urged them to accept under the condition that this work be done in a single winter, and that the stranger could use only the help of his horse, Svadilfare. Of course, the stranger accepted these terms, and began working. His work was so fast-paced that the Gods immediately became worried they would have to meet his terms. They quickly rushed to Loki and demanded he find some way of hindering the stranger from finishing his work. Loki changed himself into a mare and distracted Svad, the horse, from his work. The horse broke free and began to chase Loki, who was being chased by the stranger. They ran off deep into the forest*. Eventually realizing the deception, the stranger went back to Asgard and revealed himself to be Hrim-thurs, and would have killed the Gods had Thor not hit him square in the face with his hammer and killed him. In this case, Loki had helped the Gods to fix one of their problems. *Interesting note: Soon after this occurs, Loki gives birth to Sleipnir, who was an eight-legged steed that Odin loved to ride. Once, Loki even went so far as to help Thor get his hammer back when it had been stolen. Many of Loki’s deeds are strange: they tend to involve a problem that was created by Loki, or some petty annoyance to the Gods, but in making reparation, he tends to bring benefits and good things to the other Gods. Some examples: Once Loki took Si’s, Thor’s wife, hair and left her bald. Since her hair was one of the Goddesses favorite things, Thor became outraged. However, Loki promised to make up for this and he did. He traveled, and replaced her hair with something even better and more radiant than before. On top of that, he brings Freyr a magick ship, Odin a spear, and Thor a hammer. Loki starts off simply poking fun and playing around: often his actions are just bothersome or annoying to the other Gods, but rarely are destructive or unable to be fixed. He tends to be a petty theif: hiding the treasures of the Gods, taking the necklace of Freyja, taking the apples of youth, etc. In most cases, Loki quickly makes penance for the wrongs he’s made. Over time he becomes more malevolent and loses his love for good things. He is supposedly a representation of evil and how it can come in beautiful forms. Loki was thought to be very handsome, and on account of this most of the Gods (at first) welcomed him into their numbers and allowed him to go as he pleased. However, it wasn’t long until his deeds earned him the title “arch deceiver” or “prince of lies”. The Gods began to hate him for his malicious actions. The last crime Loki committed sealed his fate. He induced Hodur to throw mistletoe at Balder. Loki knew this would kill Balder, and was glad to do so, on account of him hating Balder’s unmatched purity. This action greatly upset the Gods and they decided Loki was no longer allowed to remain in Asgard. In an effort to escape the sadness of these recent actions, the Gods gathered for a feast with the God of the Sea. However, Loki showed up unannounced and was told to leave. He became enraged, vilifying all the gods, and slew Funfeng, a servant to the God of the Sea. Once more the Gods tried to escape the heavy-hearts they were carrying from the recent sad events. But Loki would not stop. He appeared once more, slandering and taunting each God. He pointed out their weaknesses, teased them of their physical appearances, etc. They tried promptly to ignore him, but he raised his voice louder and louder. He was just getting to Sif, and teasing her, when her husband Thor became outraged and threatened to smash Loki with his hammer. Loki disappeared for awhile into the mountains, but became increasingly worried that the Gods would be there soon to end his life. So, he rushed into a river nearby and turned himself into a salmon. The Gods caught on quickly and went after him. Thor managed to grab him by the tail, which is why the salmon is thought to have such a slim tail and is incredibly slippery/difficult to catch. The Gods bound him, using the entrails of his son Narve, and fastened a venomous serpent over his head that would drip venom into his face. However, Loki’s wife, Sigyn, showed up and quickly placed a cup over his face. She faithfully sat by him and never moved, unless to dump the venom built up in the cup. When she had to do this, it was thought that the agony of the venom hitting Loki’s face caused him to writhe in pain and make the mountains shake. Loki was left like this, and it is said he will be free of his bonds when Raganarok occurs. There once was a being called Loki. And though some of his dealings were hokey.. When he got in a tangle, some solution he’d wangle, and make everything okey-dokey. Let us all go worship Loki.